Yeah, adorable, right? And among other awesome traits, they both have the amazing ability to eat their own weight in cake, and they're the people who introduced me to Full Tilt Ice Cream. But most recently, they've secured real estate in my heart by bringing me cupcakes from Frills in Seaside, Oregon. Now, I didn't visit in person, so I can't attest to the decor, but I can say for sure that their website does not do these delicious cupcakes justice (they need more pictures!). Their cupcakes go by pretty names, which makes it a little harder to tell you exactly what I ate. Specimen one was surely the "Violette", their red velvet with cream cheese frosting, which was rich, tangy, and moist just in the right places. 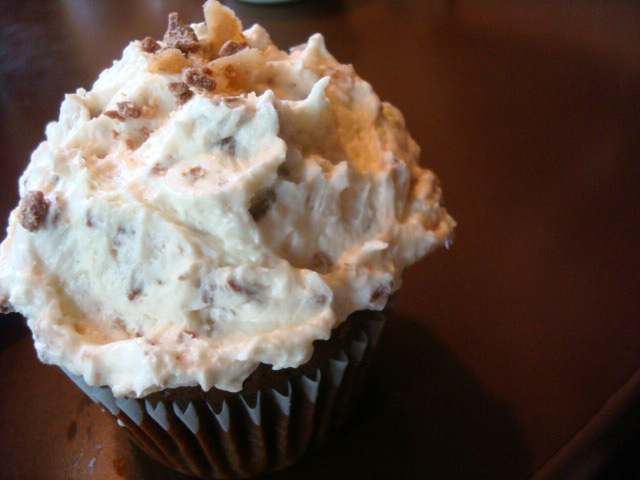 I have forgotten the name of cupcake #2, but it was chocolate cake topped with a rich, buttery frosting and what tasted vaguely like crumbled up Butterfingers on top. This chocolate cake was really something else: deep and dark, moist and fudgy, but not excessively so; the frosting was fairly light but very buttery, and extremely rich in flavor. One thing that both flavors had in common? 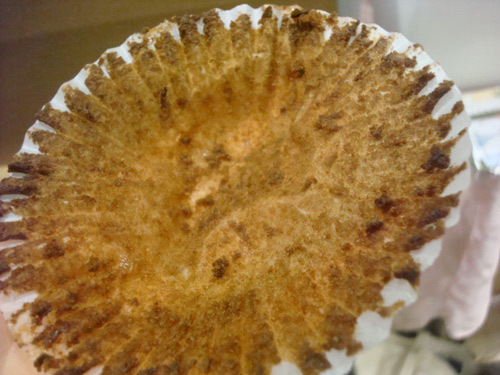 Upon reaching the empty cupcake cup, they both prompted the thought "how bad is it, really, to lick the wrapper?" Frills Cupcakes and Frozen Yogurt, 200 Broadway, Seaside, OR; online at frillscupcakes.com.